Chest injuries are quite common in sports and motor vehicle accidents, and many of them cause rib fractures. 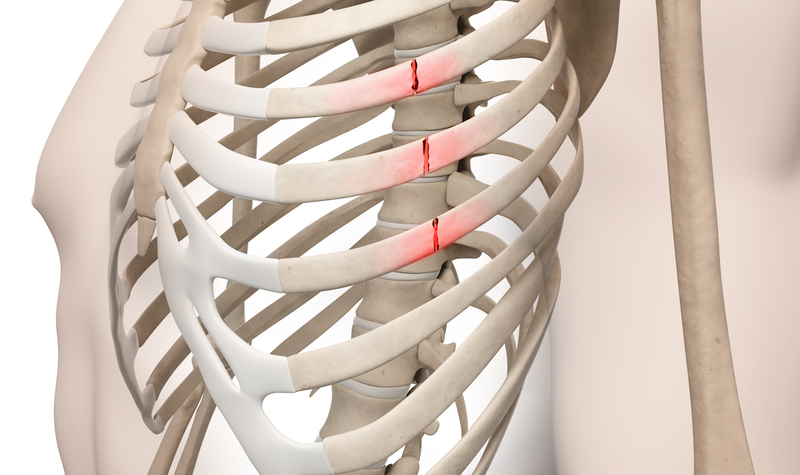 Broken or cracked ribs can be very painful, but in most cases can be easily managed, unless they have penetrated into the vital organs. In many cases, fractured ribs heal on their own in a month or two, although the condition is often associated with sharp pain, which exacerbates with movement. The healing process can be augmented with limiting activity and avoiding further injury. Another important activity that can really help is deep breathing. Fully expanding lungs using deep breathing exercises, coughing, and though incentive spirometry is very important and preventing atelectasis (or collapsed lung), which is a breeding ground for infection. A painful rib cage limits one’s ability to take full breaths, and coupled with bed rest, it can lead to atelectasis and pneumonia. Therefore, it is highly advisable to perform these activities to prevent atelectasis. Diminishing pain through over-the-counter painkillers (such as NSAIDs) can also help prevent atelectasis. For the first 4 to 6 weeks, the patient is advised not to lift more than 10 pounds or push/pull heavy objects. They should also avoid vacuuming, mowing, etc. Of course, that includes participating in contact sports. They are advised to do plenty of walking and perform low-impact exercise and resume normal daily activities. It is critically important to look out for the warning signs, which include difficulty breathing, blue-tinged lips, fever of 102°F or higher, coughing up blood or thick mucus. If any of these are experienced, one should go to the emergency room right away, as these are heralding signs of the typical complications of broken ribs – pneumonia, pleural effusion, or a punctured lung. For severe pain, opioids may have to be prescribed, but they are avoided as much as possible. This is because opioids have very high addiction potential and it may become hard to get off them. Moreover, they cause sedation and entail many precautions – including falls, handling machinery, driving, etc. They must not be taken with alcohol or other sedatives or other anti-anxiety or recreational drugs. Constipation is a very common side effect of opioids, and patients who are prescribed opioids are advised to stay well-hydrated and even take a laxative or a stool softener if needed. Ice helps decrease swelling and pain, and may even help prevent tissue damage. Use an ice pack or put crushed ice in a plastic bag. In some cases, surgery may be needed if multiple ribs are badly fractured. It is definitely indicated if there is a condition called flail chest, in which the broken ribs will need to be held together with plates and screws. Also, if there is a serious injury to adjacent soft tissue, such as an organ, nerve, or blood vessel, it will require surgical treatment. And the recovery process is contingent on the extent of the injury and the type of surgical treatment. This entry was posted in blog and tagged Chest injuries, Rib Fractures on February 5, 2019 by aenriquez. The wrist is subject to fractures due to falling with outstretched or flexed hand. This can happen in a car, bike, skiing accident or with certain other sports activities. There are two bones in the forearm including the radius and ulna. The radius is on the thumb side. A fracture of the radius near the wrist is called a distal radius fracture. Splinting is one choice for immobilizing the fracture and is commonly used for wrist fractures, reduced joint dislocations, sprains, soft tissue injury, and post-laceration repairs. Splints are mainly to immobilize and protect the injured wrist, aid in healing and decrease pain. Splints are primarily used for extremity injuries. Good anatomical fracture alignment is important. There are two types of distal radius fractures called a Colles or Smith fracture. Determining the break depends on the angle at which the break occurs. Colles fracture: results from a direct impact on the palm of the hand; a bump in the wrist results from the distal radius shifting toward the back of the hand. Smith fracture is less common and can result from impact to the back of the wrist; a bump in the palm side of the wrist results when the distal radius shifts toward the back of the hand. Once the fracture is in good position, a splint or cast is applied. The splint (or cast) will remain in place for approximately 6 weeks. A removable splint will be worn after that to allow physical therapy to regain proper wrist function and strength. X-rays may be taken at 3 weeks and 6 weeks to assess healing of fractures that were reduced or unstable. This entry was posted in blog, orthopedic bracing and tagged complex regional pain syndrome, distal radius fractures, Wrist Splint for Fracture on December 18, 2018 by aenriquez. The femur is the biggest and generally the strongest bone in the human body. Fractures take a long time to heal. Normal activities of daily living are impacted as it is the main bone used for walking and standing. Depending on the type of fracture and potential complications the impact will last a lifetime. There are several types of fractures. Each has its own characteristics. Each fracture is dependent on the force that breaks the femur. open – bone or fragments stick through the skin; also known as a compound fracture; there is damage to tissues, tendons, and ligaments. High risk of complications. A femoral fracture is normally found in severe accidents such as an automobile accident. Elderly people are subject to femoral breaks from falling due to weak bones. Hip fractures are also common with the elderly. On a special note: Compartment syndrome is caused when increased pressure inside a closed space, that compromises circulation and function of surrounding tissues. Temporary or permanent damage to muscles and nerves may result in temporary or permanent damage. Acute – most often caused by trauma, generally more minor. Prompt diagnosis and urgent treatment are required. Chronic – usually caused by exercise. Symptoms begin with recurrent pain and disability. These symptoms may subside when the cause (usually running) is stopped and returns when activity is resumed. The bones have many blood vessels that help promote healing. With time, the body will regenerate and further promote healing. Practice caution to prevent a re-fracture. A diet that contains bone-boosting foods like calcium and vitamin D helps with healing, as well as, using protective gear that can help prevent future fracture. This entry was posted in blog and tagged femoral break, femoral fracture, femoral shaft fractures, Femur Fracture Complications on December 14, 2018 by aenriquez. Arthroscopic surgery uses a tiny camera (arthroscope) to examine, diagnose and repair damaged tissues inside or around joint like the shoulder or knee. A small incision is made into the skin and the arthroscope is inserted into the area being examined. The number of incisions needed is determined by what needs to be done. Benefits of arthroscopic surgery are smaller incisions and less damage. Some physicians prefer open surgery because the structures are visible to the naked eye. It depends on what needs to be done, the specific condition, and surgeon experience. Less common repairs include nerve release, fracture repair, and cyst removal. Following surgery, someone should drive you home. Drowsiness may be felt for two or three days following the surgery. Follow post-op guidelines once home. wound care- keep the site clean and dry. Rehabilitation plays a huge role in regaining use of the of the joint and resuming daily activities. An exercise program should aim at regaining shoulder strength and movement. With more complicated repair, physical therapy will be ordered so a physical therapist can supervise the exercise program. Depending on the health condition treated, recovery times vary. A minor repair may only require a sling and a short period of physical therapy. It will take longer to recuperate from a more complicated surgery. Full recovery could take several months of physical therapy. Healing is a slow process. Surgeons guidelines and a good rehabilitation plan are important for a successful outcome, as well as, personal participation in the healing process. 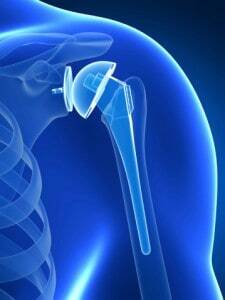 Due to the fact that shoulder surgery hurts less, patients tend to do more too soon. The area may feel fine but still needs adequate time to completely heal. Too much activity too soon can cause recurrence of the condition or other damage to repaired tissues. This entry was posted in blog, Shoulder Treatment and tagged Arthroscopic Surgery, shoulder conditions on October 31, 2018 by aenriquez. The patella is one of three bones that make up the kneecap. It is covered in cartilage on the underside and is important in maintaining the strength of straightening the knee joint. A fracture is a break in the bone. A fracture usually happens when there is a direct fall onto the kneecap. A fracture like this can also damage the underlying soft tissue and the skin and result in an open fracture. A fracture can also occur when the quadriceps muscles contract but the knee is straight. When the muscle pulls forcefully the patella can fracture. Sometimes the patella can fracture with a minor injury, but this is often a result of weak bones which can be caused by osteoporosis. Patella fractures can be severely painful and make it difficult to walk. swelling and bruising on the front of the knee. After a few days, swelling and bruising may extend down the leg. Inability to lift foot; straight leg lift is used in diagnosing this injury. With palpation a break is felt; This may not be possible if there is considerable swelling. Treatment includes an exam in the emergency room and an x-ray to determine how bad the break is, as well as, determine the type of break. One critical factor is the ability to do a straight leg raise from a laying position. This tests the quadriceps muscle and its attachment to the shin bone (tibia). A separation of the quadriceps tendon, patella and/or the patella tendon cause the inability to lift the leg. If the leg can be lifted then non-surgical treatment could be possible in order to set the fracture. Knee swelling is common and is from the bleeding from the fractured ends of the bone. If there is a large amount of bleeding then an aspiration would be done to remove the blood resulting in pain relief. In addition, a knee immobilizer will decrease the discomfort from the injury. 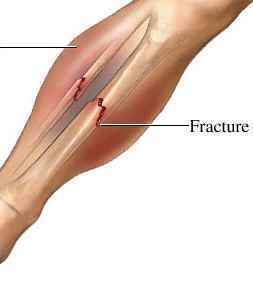 Minimally displaced fractures or non-separated fractures can usually be treated without surgery. An immobilizer or a straight leg cast may be sufficient treatment. A common complication of patella fracture surgery is the metal implants can become painful especially when able to kneel. Often there is a second surgery to remove the hardware. This can be done a year after the first surgery. An important aspect of surgery is to repair the cartilage to prevent the development of arthritis of the knee joint. Damage to the knee joint cartilage can result in a higher chance of arthritis in the joint. Rehab will be needed once the kneecap has healed sufficiently as the knee is kept straight initially to allow healing. Being able to move the knee will depend on the strength of the repair but gentle movement may begin within the first few weeks after surgery. This entry was posted in blog, Knee and tagged Kneecap Fracture, patella fracture surgery, Patella fractures, Surgical intervention on October 19, 2018 by aenriquez. Let’s discuss what a closed fracture is and then look at the list of treatment options. Be open to choosing the best healing protocol for you! Closed fractures are classified as “simple fractures” that do not puncture the skin. Although the skin is not penetrated, soft – tissue injury can be acute and alternate treatments will be offered. In some cases, surgical procedures may be imminent. Mainly, closed fractures occur from sports injuries, car accidents, accidental falls and a severe hit to the injured area. You are at greater risk for a closed fracture if you are elderly, have osteoporosis, smoke or consume excessive amounts of alcohol (which makes bones brittle), steroid use, or lengthily resting periods (which make bones stiff – causing increased risk of fractures). Please note – not all closed fractures require an intervention. Some can heal on their own, over time. It is best to know which fracture treatments are available and which ones you prefer before making an informed decision. When our doctor’s access treatment options, we look at these factors; age, what does our patient prefer and surgeon preferences (if need be). Orthopedic doctors vary in their responses as to what form(s) will be best for your closed fracture. Patients can appear to be in shock, so first, we ease their minds with simple reassurance and inspiration. Next, we elevate the area (if possible) to reduce swelling and throbbing, along with keeping it still to prevent any additional damage. We are extremely careful not to irritate existing injuries and will need to take X – Rays to ensure the extent of damage. Doctors take into consideration the severity and recommend accordingly, avoiding surgery (if possible). Disable Movement: some bone fractures do not require an intervention. We classify them as “stable” and they can be monitored without immobilization. Slings or “Walking Boots” might just do the trick in properly healing your simple fracture, where no further treatment is necessary. When you force the fracture to stay stationary, for an extended period of time, you allow it enough of a grace period to heal. Casts prevent further damage, hold bones in place and stabilize the alignment of the fracture. Surgery is the last resort to fixing a closed fracture and would be utilized in extreme cases only unless pain is unbearable at the wound site. At FXRX Orthopedics and Bracing, we offer medical fracture treatment for the following bones https://www.fxrxinc.com/fracturetreatment.html. Our patients have many good things to say about our caring staff and state of the art facility. Our staff is dedicated to providing the best care for you and your injury. This entry was posted in blog and tagged closed fracture, Closed Fracture Healing, Orthopedic doctors, Treatment Options on October 2, 2018 by aenriquez.